At times, correspondence to others may feel a bit impersonal, which is why we offer the greatest collection of holiday photo cards around! Whether it's a birthday party that will be remembered for years to come, or a bridal shower extravaganza, our custom printed photo cards are sure to add that personal touch you're looking for. Take our graduation photo cards for example. These cards are a fantastic way to commemorate a very special celebration, all while honoring the graduate photographically. Our variety of graduation cards is so wide...and wild, that we're sure to have a design or theme fitting for any personality. Our birthday photos cards, too, are a great way to create an early celebratory buzz. Photo cards usually garner a bit more attention than regular cards, so why not be the center of attention even before the party? Start celebrating the moment your invite reaches the recipient. Another simple way to keep family and friend's in the loop is with photo birth announcements. These photo announcements are fantastic at combining a birth announcement with a photo of your new bundle of joy. Wishing all your loved ones a happy new year can be an important, albeit daunting task sometimes. 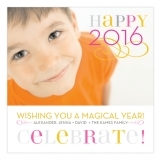 Why not jazz up your well-wishes with our New Years photo cards? Whether it's your own personal way to send holiday cheer, or a way to send a photo of the family, our New Years cards are sure to delight every person they reach. Save up to 20% or free shipping online with Polka Dot custom photo cards. For more information, contact us at service@polkadotdesign.com or call the Polka Dot hotline 1-877-816-0884.